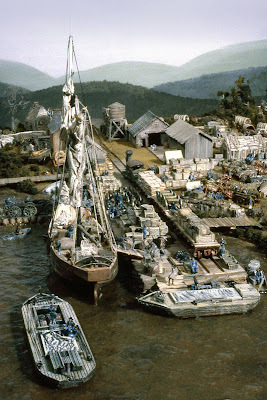 About 13 or 14 years ago, John Hill built a union army supply depot diorama in N scale. 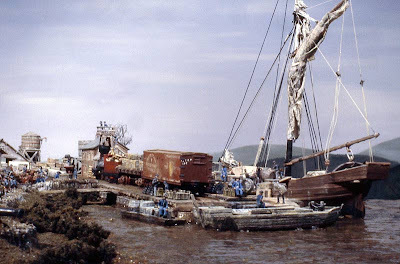 I contributed many of the figures, the sailboat and the trains for the diorama. Here are some pictures of the project. While it was a fun diorama to look at due to the intense busy scene, many of the structures and models were built using war game parts, which are designed for robustness and not fine scale. Thus the models do look a bit clunky. 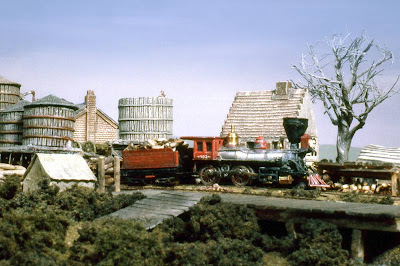 This combined with the poor running quality of N scale 4-4-0 locomotives convinced me that modeling a ACW railroad in N scale wouldn't meet my objectives. Thus began my search for a better approach that ended up with the current O Scale project documented on this blog. In developing this large scale layout I wondered if I could develop a method of adding working handbrakes to the freight cars. Even though my trains will be short, roughly 8 to 12 cars, I will probably need two man crews as the link and pin couplers require the brake men to use two hands to couple. Adding working brakes would add additional work for the brakeman and would also be realistic. Cars in this era had brakes only on one truck. Thus the linkage is pretty simple. Using some brass 1/16th inch rod and 1/32inch phosphor bronze rod I made a brake linkage based on drawings from White's book on early freight cars. This video demonstrates the holding action and release of the brakes. Since it looks like they work, the question is, do I want to add working brakes to the whole fleet? It adds about one and half hours to the construction time. I was able to spend some time testing my new 4-4-0 locomotive, the USMRR Whiton. This locomotive did not run as well as the other two I had. 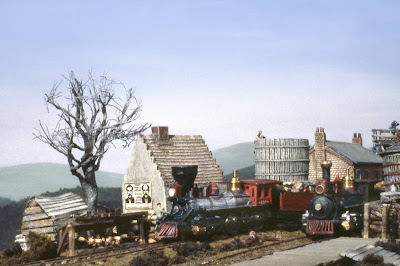 As I observed it, I noticed that it was derailing the front truck on the tight curves in this part of the layout. The derailing was occurring from interference with the pilot truck and the pilot above it. I added some shims (0.045 inches) and stretched out the spring on the mounting bolt. This raised the pilot slightly and removed the interference. That seems to have fixed the problem. I am hoping that a back EMF decoder may resolve the slowing down problem on the curve.